Photo from the book "The Family Meal"
After honing my cooking skills more in the past year, I have noticed many of my friends doing much of the same. Now I don’t know if this is just me noticing more or if there is an actual increase. It could be the former or a little of both. I don’t know. Either way, I’m really happy about the increasing amount of people having a good time in the kitchen and preparing food for themselves and people they care about. Overall, this is great for our health, our environment, and our community as a whole. When we make our own food; we know what’s in our food. When we know what’s in our food; we care what goes into our food. If you are a novice beginning to wander into the kitchen or somebody who just invested in a new set of cookware (THAT’S ME! ), then I have a quick recommendation that has been very helpful for me in the past months of increased gastronomy. It is a cookbook that I kind of wandered into. 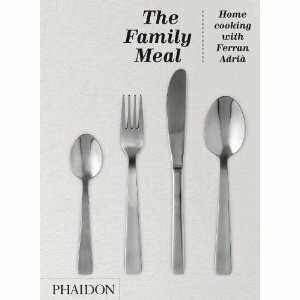 It is titled The Family Meal: Home Cooking with Ferran Adriá. This book has just blown my mind! First off, it’s very easy to use and has hundreds and hundreds of pictures so you can see what things should look like. This has been indispensable for somebody like me who is doing these recipes for the first time. Secondly, the recipes found here are not hugely time intensive. 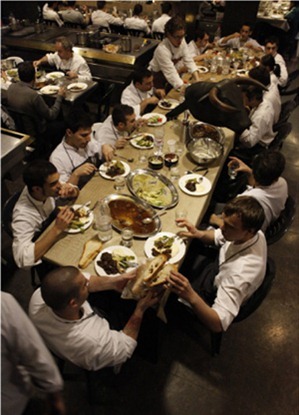 They’re arranged into three course meals and each grouping is designed to take less than two hours. Lastly, this book is from one of the best restaurants and chefs in the world. Ferran Adriá’s three Michelin star resaurant, elBulli, won top restaurant in the world five years in a row. That’s a pretty big deal! The basis for this cook book is that before each night of dinner service at elBulli, a group of designated staff would prepare a dinner and then the entire crew would gather in the kitchen to eat the prepared meal. This book records 31 days of those meals. The emphasis is on cooking relatively basic meals superbly. Adriá’s philosophy here is that a staff who eats good food together, ultimately prepares better food when the food service begins. I highly recommend this book and I look forward to seeing more of my friends in the kitchen! Below is a clip from the elBulli website that will give you a glimpse as to what they are preparing in 2014. Closing by choice in 2010, they plan to reopen in 2014. Good luck getting in!